Denver, Colorado - St. Clair Software is happy to deliver a free update to its App Tamer utility for macOS. 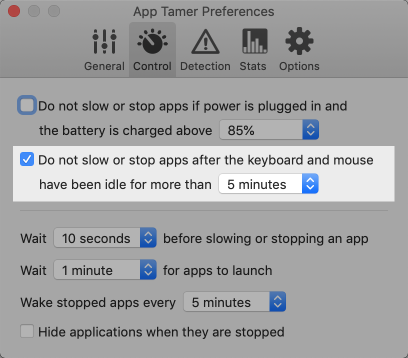 App Tamer 2.4.3 introduces a new option to let managed applications run at full speed while your Mac is otherwise idle, as well as offering several bug fixes and other improvements. * App Tamer can now be configured to let all processes run at full speed when the keyboard and mouse are idle (ie. you're away from your Mac). * A bug was fixed that could cause App Tamer to quit if it was launched when the computer was under extremely high load. * Corrected a problem that could prevent App Tamer from waking apps when you clicked on them in the Dock. * Enhanced App Tamer's 'wake' AppleScript command so you can wake up all applications. * Fixed a number of issues reported by App Tamer users. Some Mac applications, especially web browsers, continue running tasks or animations even when they're supposed to be idle in the background. This can consume valuable processing power, reducing battery life and producing heat that increases fan noise. App Tamer's unique AutoStop capability automatically slows down or pauses these applications when you switch away from them, and then restarts them when you click back to them. This frees your CPU and reduces power consumption. 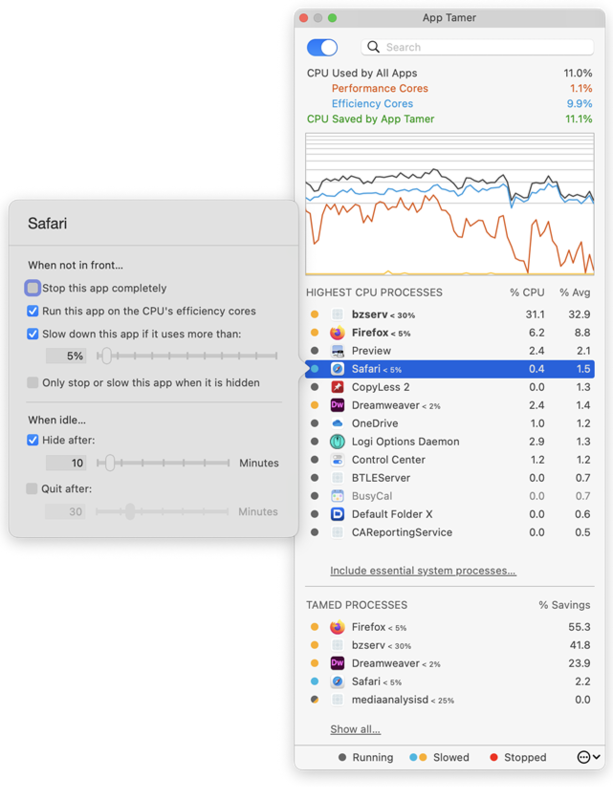 App Tamer comes pre-configured to automatically manage Safari, Firefox, Chrome, Spotlight, Time Machine, Word and many other apps when they're in the background. And customizing it for other applications is just a mouse click away. App Tamer is free to try for 15 days. A license to continue using it after the trial period is $14.95 (USD). This update is free for users who purchased App Tamer 2.x or bought App Tamer 1.x after July 1, 2013. For those that purchased a license before that date, the upgrade is $7.95 (USD). Based in Denver, Colorado, St. Clair Software is a privately held company that has been specializing in utilities and custom software solutions for the Macintosh since 1988. St. Clair Software can be contacted at: St. Clair Software, 271 S. Emerson Street, Denver, CO, USA 80209. Copyright (C) 1988-2019 St. Clair Software. All Rights Reserved. Apple, the Apple logo, and Macintosh are registered trademarks of Apple Inc. in the U.S. and/or other countries.